Ocean views. 1 queen bedroom, 1 bathroom upstairs. 2 single beds, 1 bathroom & sofa bed downstairs, (can sleep 6). Complete kitchen & cooking facilities, dishwasher. TV, dvd player, Air conditioned. Washing machine & dryer. Hair dryer. Linen & towels (bath and beach) provided. 150m. lagoon pool with water slides & waterfall, 2 heated pools & 2 heated spas. Gym. BBQ area. Kid's play area. On site -- Various Restaurants and Food Outlets, Ice Creamery, Convenience Store, Hair salon. Surf shop/hire near by. Alexandra Headland patrolled beach and surf club directly across the road. Also, a skateboard park and walking & cycling paths. Bus stops out front. 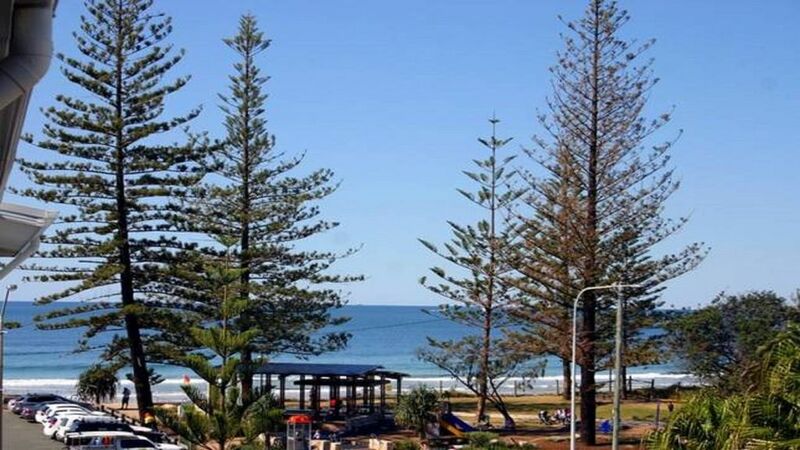 Short bus ride or walk to beautiful Mooloolaba beach with it's many restaurants, bars and Underwater World or to Maroochydore to Sunshine Plaza with it's shops & cinemas. Ten pin bowling is in the next street. Local attractions: Australia Zoo. Underwater World. Surf & Ski Park. Markets. Scenic drives to the hinterland. Wonderful apartment close to everything shops and restaurants and clubs/hotels. Weather wasn’t great but we still managed to sightsee and get great photos in between showers. Lovely host Lucia made us welcome and offered great places to eat n visit. We will be back. Thank you. We had a great stay - well set up and maintained - well stocked with everything need for a self contained holiday - as well as local restaurants, surf club across the road etc. Good communications and meet/ greet from owner Lucea. Great place to stay. All amenities available. Everything basically just a short walk away. Great pool, view and location. Really clean and great to have linens all provided. Only one downside for us which was that there is no where really to winddown and relax in the appartment. There is one couch in a courner and the TV is right outside a slat door where the kids are sleeping.